Search.searchgetstt.com is the PUP that uses misleading techniques to prevent removal. Use Reimage to locate malicious components and get rid of them faster than with uninstall instructions. A full system scan blocks virus reappearance and prevents traffic to malicious domains. 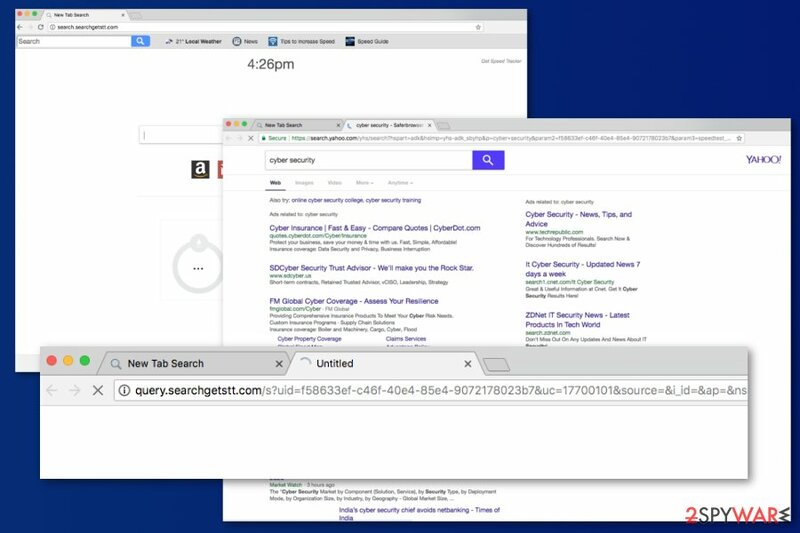 Search.searchgetstt.com is a browser hijacker created by Polarity Technologies. However, this potentially unwanted program (PUP) is presented as a Yahoo-based search engine that also offers to test Internet's speed directly from the browser's startup page. Unfortunately, this PUP can enter the system and offer its services aggressively. 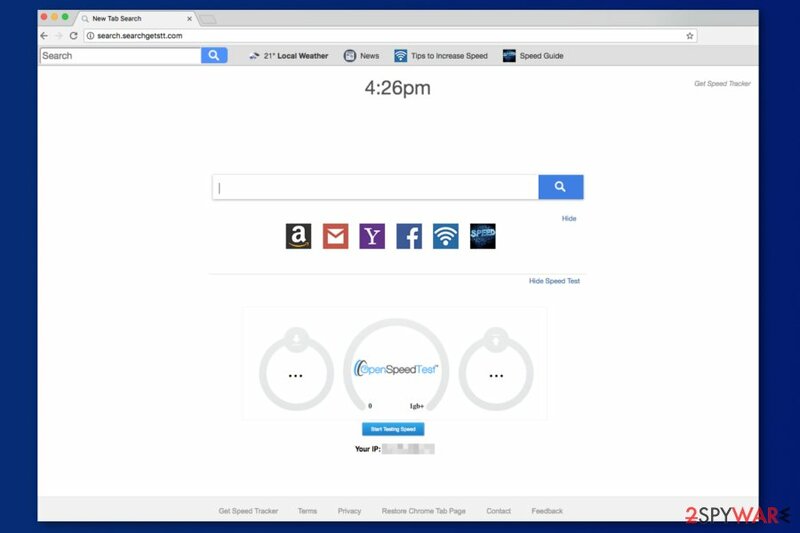 It was spotted spreading in software bundles as a Get Speed Tracker Now extension. Symptoms Replaced homepage, default search engine and new tab to hxxp://search.searchgetstt.com/, increased amount of ads appearing on the browser, browser redirects to shady sites, inability to change built-in search engine. Search.searchgetstt.com virus usually spreads and gets into the system with the help of freeware and shareware. It is offered as an optional component and can get installed unnoticed if users rely on “Recommended” installer. Once inside, the hijacker alters Windows Registry and browser's settings. 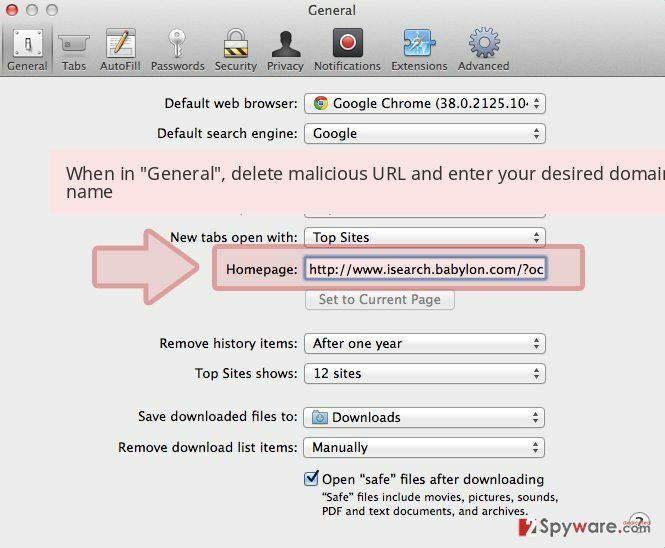 After the Search.searchgetstt.com hijack, users might find out that their Google Chrome, Internet Explorer, Mozilla Firefox, Safari or other browsers' homepage, search engine and new tab URL address was changed. However, if the victim prefers to browse through a previously-used search engine, it deems to be impossible, as the unwanted application merely reapplies its settings continually. record various non-personally identifiable information. All these features diminish browsing experience and might be risky. Thus, you should not tolerate them despite the additional “perks” the hijacker is willing to offer. The add-on which seems to be responsible for spreading dubious search engine has a theme. 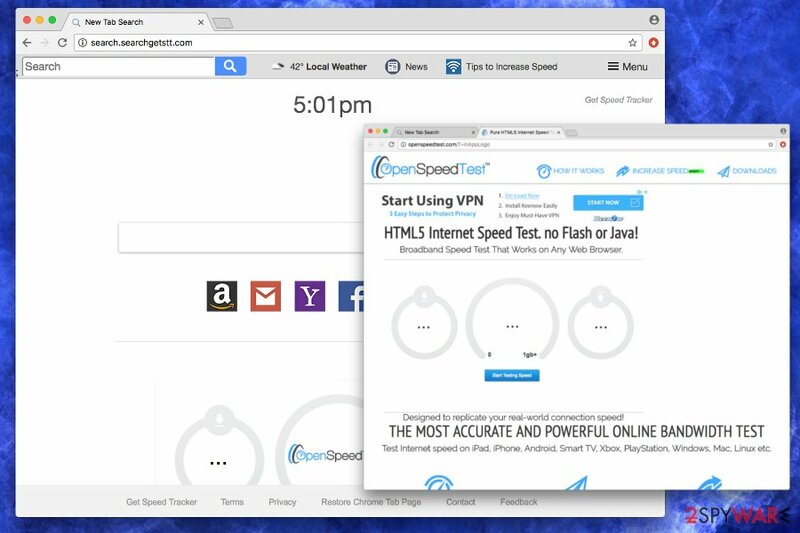 As the name suggests, Get Speed Tracker Now is all about the speed of the internet as it displays multiple links to websites which explain, how to increase internet speed. 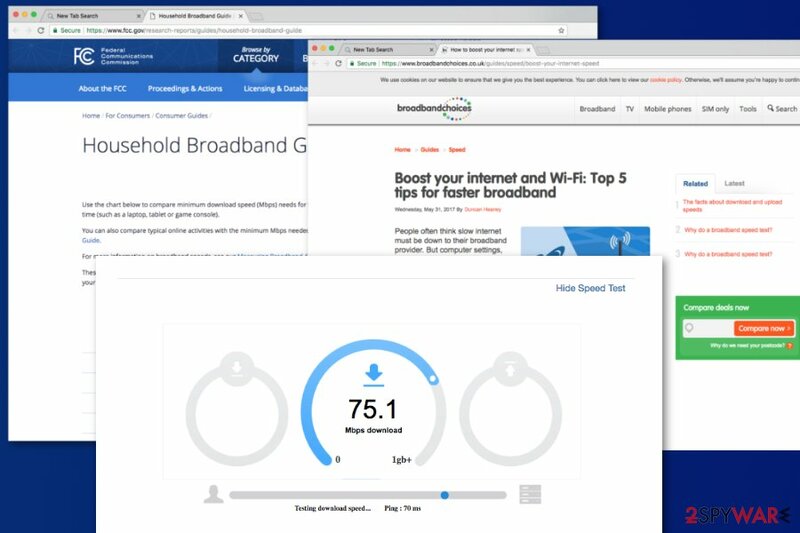 Additionally, an “OpenSpeedTest” is embedded directly into the front page, urging users to perform an internet speed test (this suspicious link leads users to the installation of a questionable application of the same. As apparent, it is entirely useless, and many other legitimate sources, such as the trusted speediest.net can be used for that purpose). Do not get tricked by this “improved functionality.” It is evident that this dubious application is promoting questionable software installment. Thus, create your favorites using Favorites/Bookmarks bar on your browser, and you will have everything you require – customized for your needs. But first, remove Search.searchgetstt.com from your PC; otherwise, the unwanted program will not leave your browser. Developers note that aggregated details might be shared or sold to third-parties. In most cases, these affiliates are advertising networks. However, you can never be sure when details about you might end up in the hands of cyber criminals. Thus, you should stop shady tracking sessions by eliminating the hijacker. 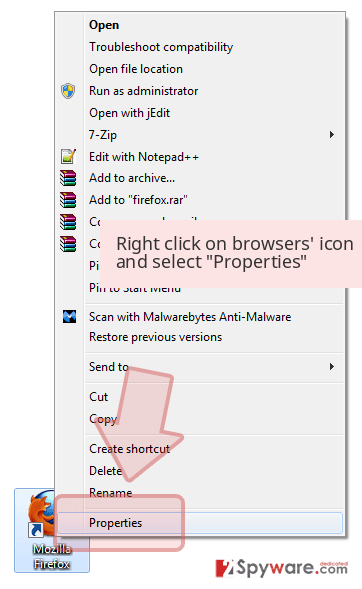 You can get rid of the browser hijacker with anti-malware software, such as Reimage. 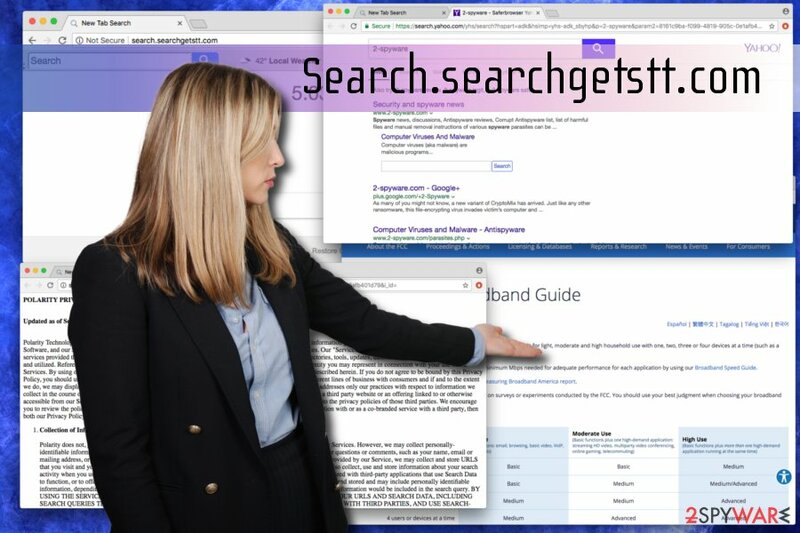 However, if you do not want to use additional tools, you can follow manual Search.searchgetstt.com removal guide at the end of the article. Bundling is a successful marketing campaign and is used for additional software promotion. Why is it wrong you ask? Well, extra programs offered are mostly useless for regular PC users. Instead, suggested applications only disturb web browsing sessions. Thus, you better learn how to avoid such unwanted programs. Research conducted by IT professionals at Viruss.lv determined that the main mistake victims make is picking “Recommended/Quick” mode when installing freeware from the internet. Users then skip steps, rush the installation process and fail to notice that they just agreed to install adware or PUPs without even realizing it. Therefore, make sure you pick “Advanced/Custom” settings and withdraw apps like toolbars, optimization tools, search engines, add-ons, etc. Uninstall suspicious programs via Control Panel. The instructions below will explain to you how to get rid of the hijacker and its related components manually. However, we suggest automatic Search.searchgetstt.co removal. 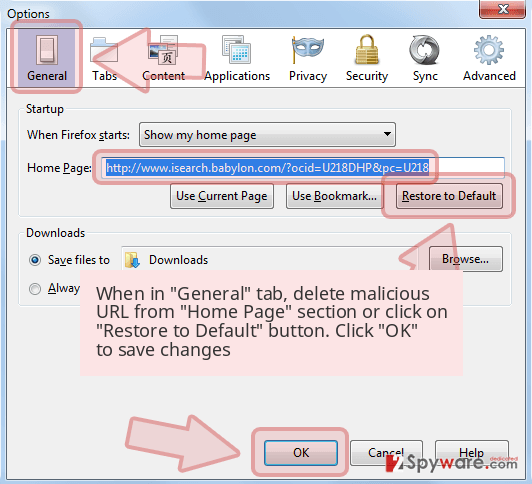 This method is simpler and ensures that your browser won't be hijacked again. Meanwhile, a re-hijack issue might occur after manual elimination. Sometimes potentially unwanted programs hide in deep in the system and can be hard to find. Here, look for Search.searchgetstt.com or any other recently installed suspicious programs. Wait until you see Applications folder and look for Search.searchgetstt.com or any other suspicious programs on it. Now right click on every of such entries and select Move to Trash. 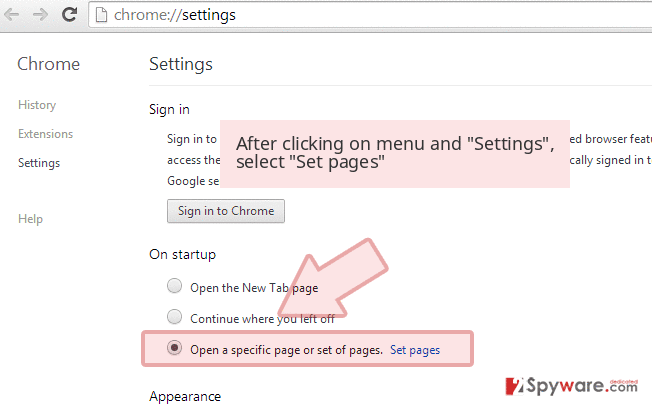 When in the new window, check Delete personal settings and select Reset again to complete Search.searchgetstt.com removal. 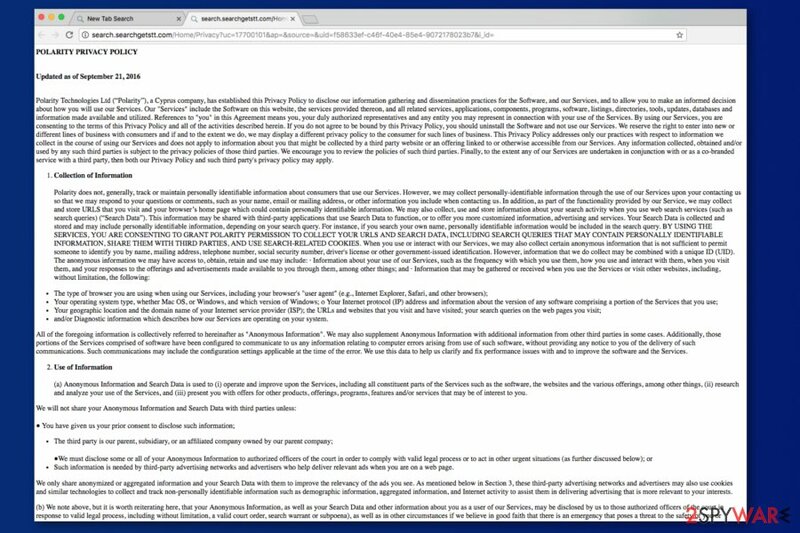 Once these steps are finished, Search.searchgetstt.com should be removed from your Microsoft Edge browser. Do not forget to reset your Mozilla Firefox settings to default in order to delete tracking cookies that may have been installed by Get Speed Tracker Now or other PUPs. Here, select Search.searchgetstt.com and other questionable plugins. Click Remove to delete these entries. Now you will see Reset Firefox to its default state message with Reset Firefox button. Click this button for several times and complete Search.searchgetstt.com removal. Here, select Search.searchgetstt.com and other malicious plugins and select trash icon to delete these entries. Click Reset to confirm this action and complete Search.searchgetstt.com removal. 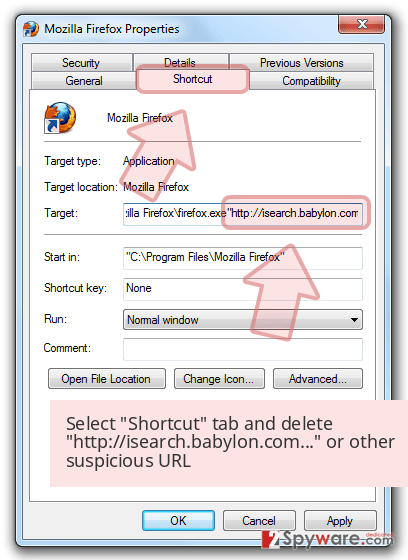 Here, select Extensions and look for Search.searchgetstt.com or other suspicious entries. Click on the Uninstall button to get rid each of them. Here, look at the Homepage field. If it was altered by Search.searchgetstt.com, remove unwanted link and enter the one that you want to use for your searches. Remember to include the "http://" before typing in the address of the page. Now you will see a detailed dialog window filled with reset options. All of those options are usually checked, but you can specify which of them you want to reset. Click the Reset button to complete Search.searchgetstt.com removal process. ^ Browser Hijacker. Malwarebytes. Security experts. 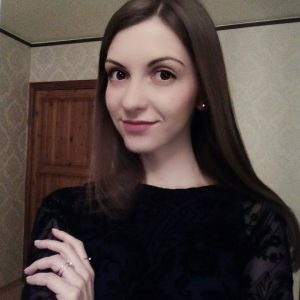 ^ Viruss.lv. Viruss. Latvian cybersecurity experts. ^ Chris Hoffman. PC Cleaning Apps are a Scam: Here’s Why (and How to Speed Up Your PC). How-To Geek. A site for Geeks, by Geeks. This entry was posted on 2018-03-16 at 09:42 and is filed under Stealing programs, Viruses. You can quickly scan the QR code with your mobile device and have Search.searchgetstt.com manual removal instructions right in your pocket. How did you remove Search.searchgetstt.com?